When reporting his death 'The Buxton Advertiser' stated that Alfred: "... has been out to France on two occasions, and was once invalided home suffering with trench fever and rheumatism." Alfred's Service papers have not survived and his Medal Index Card indicates that he was posted to France with his Battalion after the end of 1915, as he was not eligible for 1915 Star Medal. He enlisted at Buxton into the 2/5th Battalion, which was formed at Derby on the 16th October 1914 as a second line unit. His Service Number suggests that Alfred might even have been a serving soldier in the Territorial Force at the outbreak of the War and subsequently rebadged. If not it is more than likely he enlisted very early on. In January 1915 the Battalion moved to Luton and placed under command of 2nd Notts. & Derby Brigade in the 2nd North Midland Division. In August 1915 the Division became the 176th Brigade, 59th (2nd North Midland) Division and moved to Watford after a few weeks at Dunstable. They moved to Ireland in April 1916 to quell disturbances, before returning to Fovant on 12th January 1917 and finally landed at Le Havre on 26th February 1917. Pte. Wardle has been out to France on two occasions, and was once invalided home suffering with trench fever and rheumatism. He underwent treatment at Lincoln and Woodhall Spa, and returned to France in January of this year (1918). Hopes are still entertained that the information may be incorrect." On the 21st March 1918 the village of Bullecourt was defended by the 59th Division, but the Germans broke through and the village remained in German hands until September 1918. On the morning of March 21st the 59th Division, including the 2/5th Sherwoods, held a position on the right flank of the front line round Bullecourt. According to "The Green Triangle" (page 148) the Germans attacked at 4.30 a.m. with a heavy bombardment of gas shells. The Companies put on their gas masks and moved to their allotted positions - 'B' Coy. right front (Noreuil Switch); 'A' Coy. left front (Sidney Avenue); 'D' Coy. in reserve and 'C' Coy. in support. About 5.00 a.m. the bombardment intensified and switched to High Explosive shells and 'A' and 'B' Companies suffered many casualties from the weight and intensity of the barrage which lasted about 4 hours. During this time various messages were sent from HQ to ascertain the state of the Battle but by 1.00 p.m. the enemy had taken the Noreuil-Longatte Road and were in the village of Noreuil. A short time later it became apparent that the Battalion had been overwhelmed. "In the Battle Zone, where the fog had completely lifted, an attack on the defences covering Noreuil, held by the 2/5th Sherwood Foresters and an R.E. [Royal Engineers] detachment, began as early as 10.40 a.m., being preceded by a heavy barrage. Met by fire from the defences and the covering batteries, the enemy ceased his frontal attack to wait for the effects of the advance around both flanks of the position, that in the Hirondelle valley being already perceptible. To meet these turning movements, the right flank of the defence was thrown back, whilst, on the left, a line was manned along the road from Noreuil towards Longatte. The movement up the Hirondelle valley gained ground so rapidly, however, that the right flank of this position was soon driven in, Noreuil was captured, and the men still holding trenches in front of it were cut off. At noon, the 2/5th Sherwood Foresters, reduced to 150 men, was still clinging on near the south-west corner of Noreuil, with its right flank thrown back fronting the Hirondelle valley, and its left flank on the Longatte road, facing north-east. It was well supported by batteries of 295th Brigade RFA, which however found difficulty in selecting targets, as British and German parties kept appearing alternately only some 300-400 yards apart. At this time the German infantry, although its detachments constantly advertised their position by means of white Very lights, had not effective help from the artillery, which put down a barrage on the western edge of Noreuil, some thousand yards in rear of the advanced troops. About 12.30 p.m. a message reached the Sherwood Foresters, stating that supports were being moved up to a trench 500 yards behind Noreuil, and a runner arriving from the rear at that moment reported that he had seen men in the trench. Lieut-Colonel H.R. Gadd thereupon decided to fall back on this support. It was just too late, the greater part of the survivors were surrounded from the north and cut off. Some held out until 3 p.m. but only a few managed to join the supporting force which had moved forward from behind Vraucourt about noon." The Battalion War Diary was lost during the Battle, but has been partially reconstructed and can be read using the link below. The C.O. Lieutenant Colonel H. R. Gadd, M.C., was recorded in the figures as missing, but was taken prisoner and repatriated on the 8th December 1918. His second-in-command, Major C. R. C. Trench, distinguished himself during the Battle and was Mentioned in Despatches. He was, however, killed in action on the same day as Alfred. On his repatriation, Colonel Gadd wrote to General Stansfield, giving his account of the Battle - also below. According to the CWGC Records, Alfred was one of 105 Officers and men of the Battalion to be killed on the 21st March 1918. 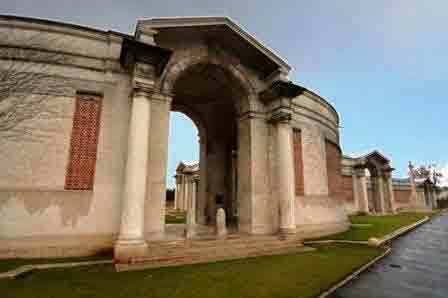 Only 6 have a known grave, the rest, like Alfred are commemorated in Bay 7 of the Arras Memorial. [The 2/6th Battalion lost 126 men and the 2/7th a further 150.] 'The Register of Soldier's Effects' acknowledges that 21 March 1918 had been "officially accepted" as the date of Alfred's death, as his remains had not been found. Sherwood Foresters, both Buxton men, were killed in in the same action on 21 March 1918.